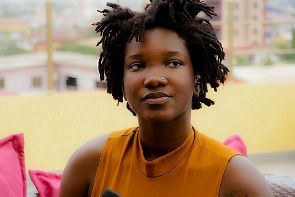 Reports Dawuroo.com has gathered indicates that Ghanaian dancehall artist born Priscilla Opoku Kwarteng popularly known as Ebony Reigns is dead. Ebony Reigns was returning from Sunyani after a visit and got involved in a car accident and died at the Bechem Government Hospital. She was in a Jeep 4×4 car which collided with VIP bus at the Bechem Junction(Nkwanta).The driver however survived and is receiving treatment according to our reporter. Her remains is currently at the Mankranso hospital mortuary. The Pictures are so gory that we have to edit them to meet our editorial policies before we can share.Stay tuned for more.